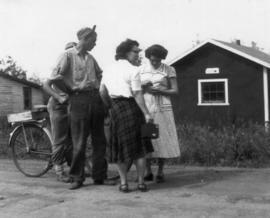 Roy Perrson, Claire Menard and Adeline Halvorson in front of the Post Office that was situated on Main Street next to the Jubilee Theatre (Jonique's) in 1951. 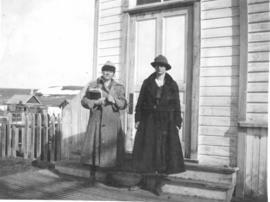 2 young women on front steps of a building, Okotoks, AB. 20th Anniversary of Morris and Sarah Kagna. Muriel and Clem Collins in the buffet line at a banquet to celebrate their 25th wedding anniversary, surrounded by many friends. 25th wedding anniversary of Mr. and Mrs. Chris Moen and Mr. and Mrs. T. K. Rogne.